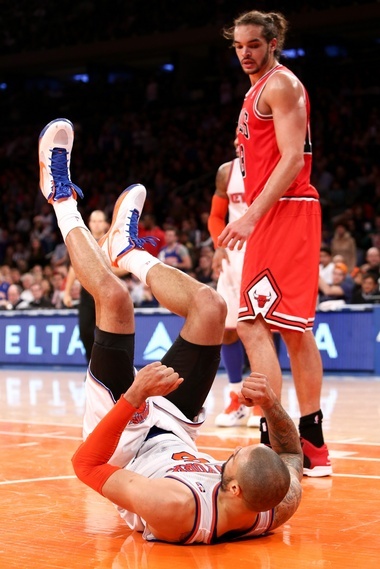 Knicks went shopping, K-Mart had it all!! The New York Knicks were a team struggling through injuries, poor form, lack of confidence and a general lack of energy on both ends of the floor. At the time of the 2013 trade deadline it was widely supported by fans as well as NBA analysts that if the Knicks were to become a legitimate Championship contender, changes needed to be made! 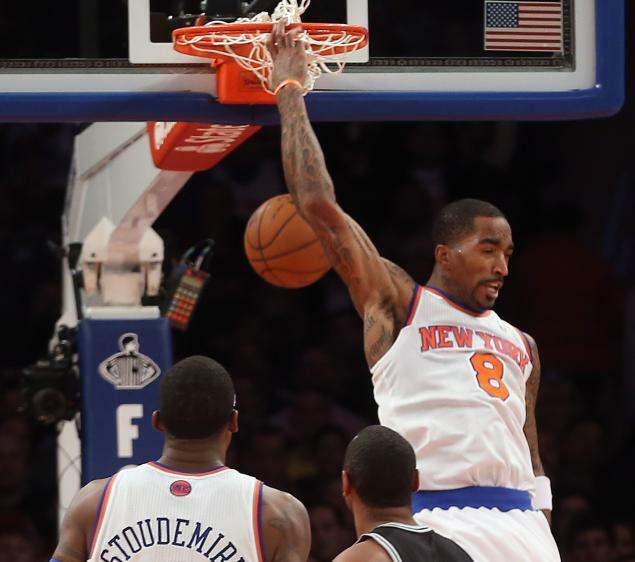 Many rumors circulated, surrounding Amare Stoudemire, Steve Novak and many more, however nobody expected what the trade deadline would bring to the New York Knicks. The Knicks traded their best perimeter defender (Ronnie Brewer) for what can be basically described as a nothing pick to the OKC Thunder, which in turn created a spot on the roster for a potential free agent. Now before going on it must be said that the Knicks were struggling for depth in their front court, with injuries to both veteran big men, Marcus Camby and Rasheed Wallace. 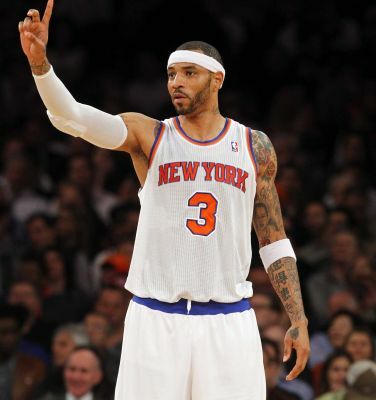 So free agency was explored and the spot was filled with the 35 year old, 6’9, 240 pound Kenyon Martin. After a slow start as a New York Knicks Martin has worked his was not only in to the rotation but in to the starting five. With the unforseen injury to Amare Stoudemire as well as the previously mentioned veteran Knicks, K-Mart took up the opportunity presented to him and after two consecutive 10 day contracts the Knicks signed him for the remainder of the season. Also helping Martins cause was the multitude of injuries bothering Tyson Chandler, which in turn has caused him to miss the last six games. 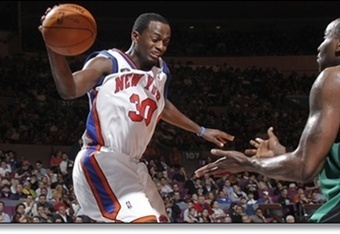 Now Martins value to the Knicks far exceeds anything which is measured by statistics, defensive ability and/or versatility, as well as the ability to finish around the rim. His fellow team mates have spoken about his vocal contribution on the defensive end and Knicks head coach Mike Woodson has been impressed with what he has seen. Now Martin himself has commented on his recent impact on the Knicks and his desire to play continue playing NBA basketball in the future. The New York Knicks started the season as an impressive veteran team with a lot of upside and no real weaknesses, going 21-9 in the month of November and December before then falling to a record of 13-11 in the month of January and February. Now with a current record of 38 and 26 many would argue that it is not time to reach for the panic stations just yet, but lets take a closer look at things. The Knicks are currently on a 4 game losing streak, in fact they are currently facing a record of 4-6 over the month of March and things are not looking to improve for them any time soon. Now if the Knicks truly are taking the season one game at a time then by all accounts they should be able to turn this ‘slump’ around and rectify what is quickly becoming a disastrous month of basketball. Looking ahead,it is certainly possible for the Knicks to turn the month of March in to a winning one, with games against the Utah Jazz, Orlando Magic, Toronto Raptors (x2), Boston Celtics, Memphis Grizzlies and the Charlotte Bobcats winnable games are fast approaching the Knicks. Now winning the Atlantic Division is another matter all together, the Knicks are currently 1 game ahead of the Nets and 2.5 games ahead of the Celtics. Both teams are playing great basketball, with what look to be favourable schedules. Both the Nets and Celtics are strongly competing with the Knicks for the top spot of the Atlantic Division. If the Knicks can rectify their current slump and put some wins together then they are in a position to not only win the division, but take out the second place of the Eastern Conference (behind the Miami Heat). Injuries have plagued the Knicks this season and they are currently without their, as some may call it ‘Big 3’. Tyson Chandler is suffering a left knee contusion, which he suffered in Wednesdays game versus the Nuggets, as well as what is reported as being a strained neck. The previously mentioned injuries have caused him to miss the Knicks two previous games versus the Blazers and the Clippers, he is currently listed as day-to-day. Carmelo Anthony had fluid drained from his right knee on Thursday after suffering what the Knicks have listed as a ‘right knee injury’. 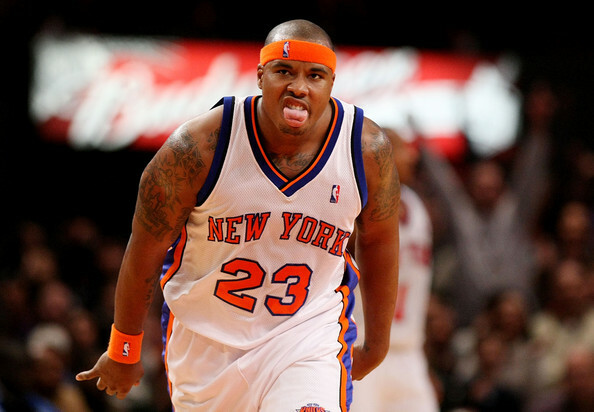 Anthony has missed five of his last seven games for the Knicks and is currently listed as day-to-day. Amare Stoudemire is again side lined with knee issues, this time having his right knee ‘cleaned out’ which will result in a six-week recovery and should see him returning at some stage in the first round of the playoffs. To go along with all of this, the recent come back king Rasheed Wallace has undergone surgery on his fractured left metatarsal (foot). Similarly to Stoudemire, Wallace is scheduled to return for the first round of the playoffs, however the veterans fitness will become an issue for the Knicks. The Knicks are still a top 10 ranked team in terms of efficiency on the offensive end of the floor, although have slipped to 16th place on the defensive end (according to Hollinger Stats of ESPN.com) and Stats don’t lie, however neither does recent form and in 2 of the Knicks last 4 games they have allowed their opposition to score over 100 points. As well as this they have struggled to score the ball with field goal percentages of 27.4%, 43%, 43.9% and 35.8% over their last four games. Now free agency still interests the Knicks, in fact Knicks head coach Mike Woodson has stated that he will be sitting down after their current 5 game road trip with Knicks GM, Glen Grunwald to discuss their options. According to Newsdays Al Iannazzone, Woodson has been quoted as stating that “I think we have till the later part of March to make some decisions”. Now according to various media outlets the Knicks have been reported as having an interest in Delonte West, and on all accounts they are ‘tracking’ his progress. Are they down for the count? will they slip down the conference standings? is their age starting to show? Well these are all questions that only the playoffs will allow us to answer, but the Knicks have every chance to find some form, get healthy and make a strong push in the 2013 NBA playoffs. Being a veteran team, the Knicks will not lay down and let this season get away from them but health is a serious concern. Timothy Theodore “Tim” Duncan (born April 25, 1976) a 6-foot 11-inch (2.11 m), 255-pound (116 kg) power forward – Center (many still debate what his true position is) and currently in his 16th season all with the team that drafted him #1 out of Wake Forest the San Antonio Spurs. For all that Tim Duncan has accomplished in his amazing career, it’s what he hasn’t done that makes him truly remarkable. He didn’t grow up with a basketball in his hands, dreaming about hoops stardom. He didn’t have his choice of college powerhouses when the recruiters came calling. He didn’t leave school early and chase after the big money which makes him so much more humble as he was touted a number 1 pick every year of his career. And since entering the NBA, he has never been anything but an exemplary teammate and perfect role model. No, Tim is nothing like your typical superstar athlete Like a Shaq or Kevin Garnett of the time, but Tim Duncan is a once only player that has done nothing short but make people in owe of him throughout his career. The only player in NBA history to be selected to both All-NBA and All-Defensive Teams during each of his first 13 seasons. Tim is not only a freakishly good athlete, he is a freakishly talented big man. Indeed, there is very little he cannot do with a basketball in his hands. Tim is hard to strip, hard to block and hard to stop, because if you stop one move, he usually has a counter-move that follows. He has a wonderful touch around the rim, and who can forget that amazing bankshot he has made a name for and is one of the NBA’s great old-school moves. 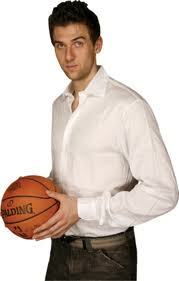 He is also one of the best-passing big men ever. 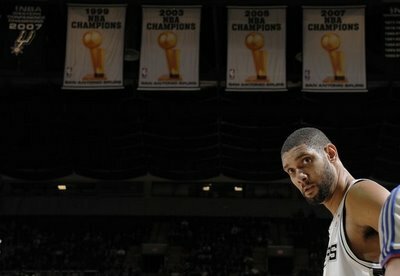 It’s what Tim can do when the ball is not in his hands that truly sets him apart. Even in his mid-30s, he is so agile and has such quick feet that he can wait an extra second on plays and still beat most defenders to a spot. Tim Duncan is a Hall of Famer in every sense of that label and in my opinion the greatest Power Forward to play our game and arguably a top 5 player ever. Ill let the professionals finish with some things to think about referring to a superstar that I can confidently say we will never see anything like him again. When you think of intensity, when you think of heart, and when you think of attitude, look no further than the 6’11 power forward out of Farragut Career Academy in Chicago. Kevin Garnett’s personality is one of the most well-known in the game, even today. It isn’t just his personality that has left an imprint though. Garnett is known as one of the best defensive players in NBA history, and even as his career turns on its final leg, he remains one of the biggest defensive forces in the league. For now, we look back and reminisce on the 1st-ballot Hall of Famer’s career. What that clip also states is that at the time of the 2011 All-Star game, it was Garnett’s 14th straight trip (that streak ended in 2012, but he once again started at age 35 in 2013). He has so many accomplishments throughout his career that it is hard to count. Here are a few of his NBA accolades. These awards and achievements truly show his greatness, but Garnett’s presence in NBA games can not even be shown statistically. 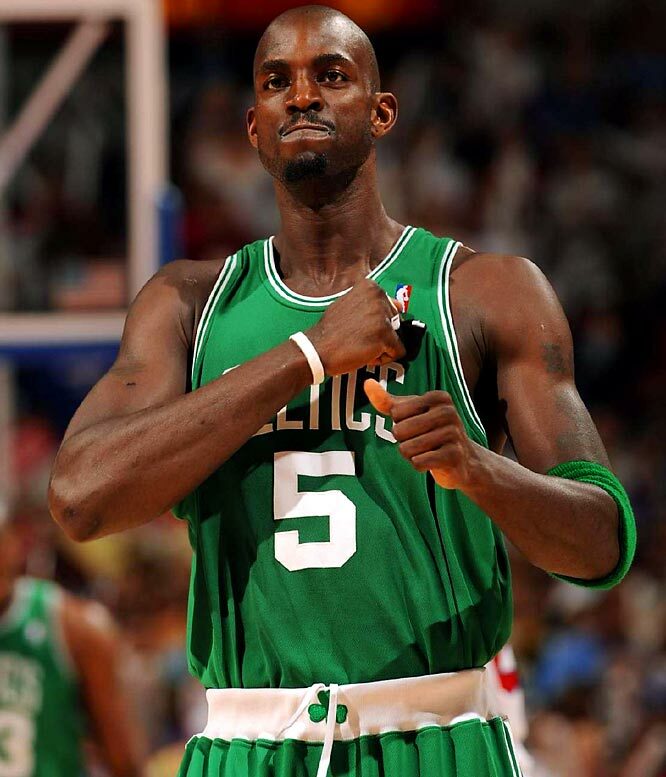 He is the heart and soul of the current Boston Celtics (Along with Paul Pierce). He spaces the floor unlike many great defenders, and still controls the game defensively for the Boston Celtics. His intensity, power, and heart have been leading reasons as to why he is one of the greatest power forwards in NBA History (Opinions vary, but Tim Duncan is most definitely the other great PF of this generation). He is of a dying breed of players that we love from our childhood and will greatly miss in this league, as they enter their final stretch. Kevin Garnett is truly a Living Legend.